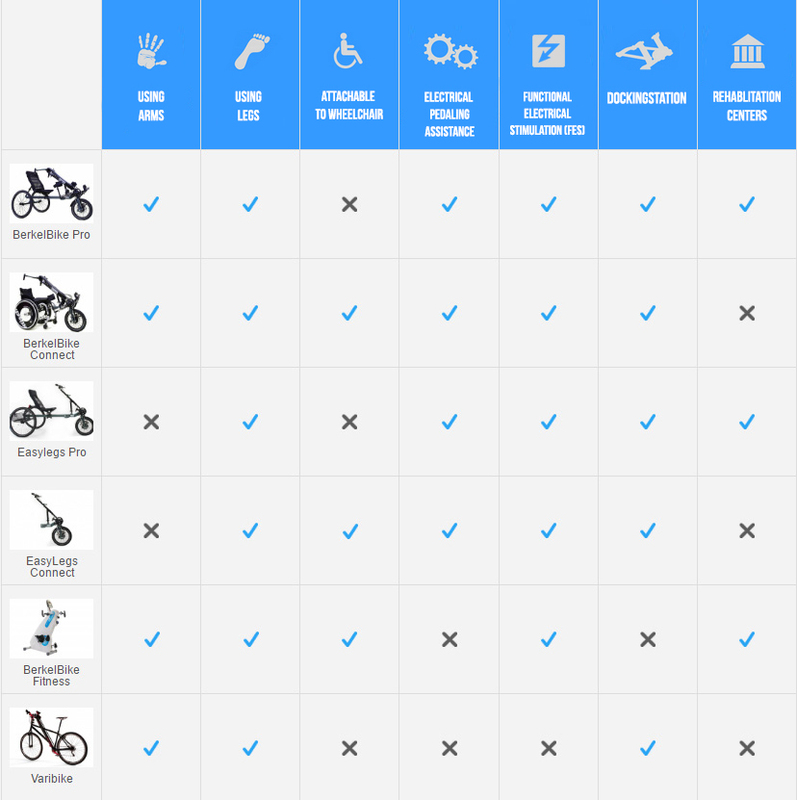 BerkelBike Connect – Simply convert your wheelchair into a tricycle! The BerkelBike Connect is a bicycle extension with one wheel that can be attached to a wheelchair. It can be used to train the arms and legs simultaneously. It has the same handles as a handbike while the standard pedals are the same as those of a traditional tricycle. WANT TO TRY OUT THE BERKELBIKE CONNECT YOURSELF? The handles and foot pedals are connected to synchronise the movements and allow the arms to support the legs when necessary. It is also possible to only use the legs while cycling while holding the handles like a steering wheel. If the handles are rotated, the foot pedals will follow the rotation. This way, the user can choose to let their legs do the work or to support them with arm power. The pedal assist system helps the user perform a full cycle with the pedals. This is even possible if the legs have limited strength and coordination. 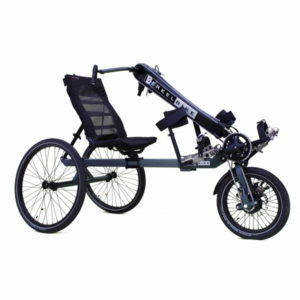 The pedal assist system and the combination of arms and legs allow the user to distribute the effort during the cycling. The user can also choose to let tired limbs rest if necessary yet continue to cycle. A trip with the BerkelBike Connect translates to a full body work out. Body parts with reduced function are exercised while limbs with normal function can also get effective training. The BerkelBike can be combined with our electrical system in the case of a spinal cord injury to get paralysed legs moving again. WANT TO KNOW MORE ABOUT THE BERKELBIKE CONNECT? Richard uses the BerkelBike Connect and attaches it to his wheelchair. The VR Docking Station allows him to cycle his favorite route indoors, even if the weather it is poor. This way he can continue to follow his progress, even in winter. Functional electrical stimulation allows him to cycle with both his arms and legs even after a spinal cord injury. Richard has made enormous progress and is now able to cycle solely using his legs.Thanks to the BerkelBike Connect he was able to rebuild muscle mass in his legs. The BerkelBike Connect can help you to maintain or regain much of your independence. 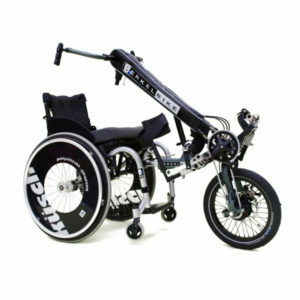 Because you don’t have to transfer from a wheelchair to a bike, is it a handy companion for your daily activities. In addition, it ensures that you stay mobile while at the same time keeping you moving in a nice and convenient way. People suffering from various different medical conditions use the BerkelBike Connect in their daily lives. The most common conditions among our clients include transverse lesions, multiple sclerosis, amputations, neuromuscular disorders and brain injuries. The bicycle was developed in the Netherlands in collaboration with doctors, therapists and researchers from different rehabilitation centers. It can be used in physical therapy to build up strength and muscle mass for people who have lost part of their leg function. 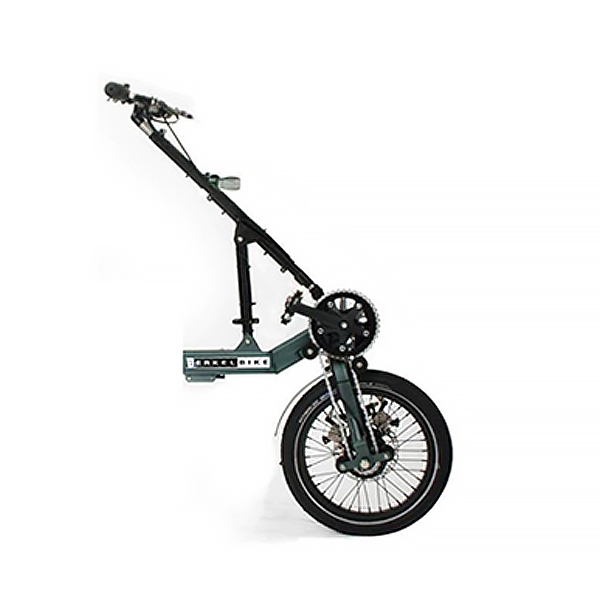 The BerkelBike product has won several awards for its technological innovations. Combined with our FES system, it can be used by patients with transverse lesion and by tetraplegic patients. 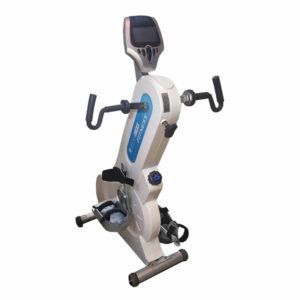 By performing a full cycling motion using the legs, the user builds up muscle mass and the blood circulation is improved. The functional electrical stimulation enables the user to cycle with a tricycle using their own leg and arm power, even after a transverse lesion. It’s been a while since Emily tried the BerkelBike for the first time. She fell in love with the bicycle because the stiffness and pain in her legs disappeared completely. Although she cannot walk, she enjoys training her legs without pain and doesn’t have to take medication. Emily bought the BerkelBike and trains a few times a week to soften the pain in her legs. The BerkelBike is available in two versions: the Pro and the Connect. The Pro is comparable to a three-wheel recumbent, while the Connect is a single-wheel extension that can be connected to a wheelchair and transform into a full three-wheeler. The Pro can be easily disassembled without tools so that it fits into any car. Photo: BerkelBike PRO (Left) and BerkelBike Connect (Right). WANT TO TEST THE BERKELBIKE CONNECT YOURSELF? The Connect has been developed for use in combination with your wheelchair. The greatest advantage is that the user doesn’t have to transfer from their wheelchair to the bicycle. The Connect is especially convenient for social and daily activities such as shopping, visiting friends and taking a ride in the park.